It all started with the Stitch11 Snake Puppet. It wasn’t long before my daughter and I also designed the Puppy Puppet. And now a few years later, my daughter still requests the puppy puppet during bath time. <3 When I told her how long she has had her puppet, she agreed that she really LOVES it, and requested I make a cat puppet too. Medium/worsted weight yarn (I prefer Red Heart brands) I used red. DK weight yarn (I used Cascade Yarns) I used eggshell, brown, pink and teal. Now you will start working in rows. Row 15: CH 1, SC around the entire piece. (1 SC for each HDC. 2 SC on the corners. & when you get to the part of the arm that has slip stitches, SC right over the slip stitch- not into it) Join to first SC. Finish off. and weave in your ends. Repeat steps 1-15 for the other side. Using white/eggshell DK weight and 3.25 mm hook. Using your yarn needle and the other DK weight colors, embroider the eyes to look like cat eyes. Weave in ends and attach them to the face of the puppet. Embroider the nose and mouth, and whiskers onto the face of the puppet. Attach both sides of the puppet together. Make sure the clean sides of the puppet are facing out. Attach the red yarn to any outer stitch. Using the 5 mm crochet hook, CH 1, SC around to join the pieces. I put 2 SC into the corners of each arm. DO NOT crochet the bottom of the puppet closed. Using med/worsted yarn. I used red. Use a 5 mm hook. Row 1: CH 6, skip 1 CH. HDC into next 5 CH. Row 2: CH 1, turn. 1 SC into each of the 5 SC. Row 3: CH 1, turn. 1 SC into each of the 5 SC. Row 4: CH 1, turn. HDC DEC. HDC. HDC DEC.
Row 5: CH 1, turn. HDC 3 together. Using your yarn needle, attach the ears to your kitty puppet. Great puppets. I made your puppy puppet, for my grandson. (3yrs) He loved it. 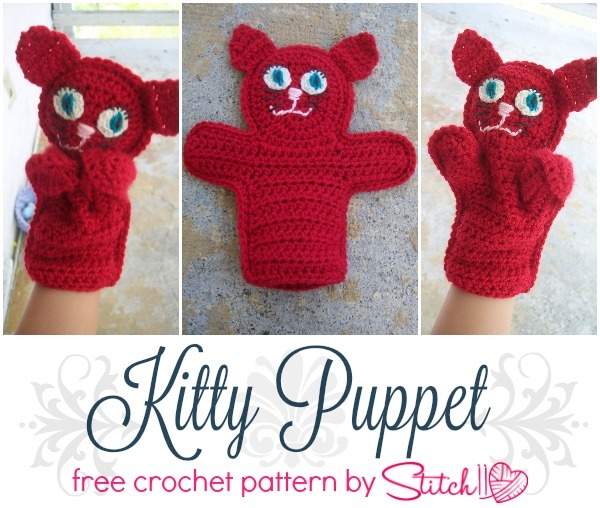 I will have to make a couple of more, starting with your Cat Puppet. Thank you for the fun pattern.